Marvin recently went to a theme park. He thought the best thing was the roller coaster. So he went to the library to find out who invented this really cool ride. He discovered that the first roller coaster was built in America by accident! In the mountains of Pennsylvania the coal mining company built a roller coaster to carry coal from a mountaintop to the boats waiting below. It was 18 miles long and it dropped more than 1,200 feet. Many people came to see it and wanted to have a ride so the coal company used it for fun rides and made a lot of money. 1) What do computer scientists eat? 2) What do frogs drink? 3) What do jelly babies wear on their feet? 4) What do you get of you cross a pig with a cactus? This week we have a picture from Basile who is in the Kindergarten class. 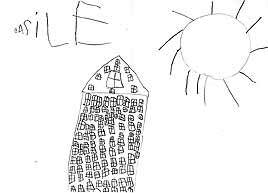 He has drawn a picture of a hotel. It has 67 windows. Can you count them all? 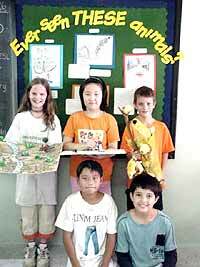 If you have a question about animals, Leslie Wannemacher’s Grade 4 class at Chiang Mai International School (CMIS) can probably provide an answer. The class’s twenty students have been exploring the world of living creatures lately and they are well on their way to becoming animal experts! Every good investigation begins with gathering facts, so Mrs. Wannemacher’s class hit the books and dug up all the information they could on animals from Anteaters to Zebras. They put their note-taking and research skills to the test when they wrote animal reports. The young researchers also created animal models and opened their own “zoo” for younger students at CMIS to visit. Grade 4 guided other elementary students through their exhibition, answering questions as well as any “animal expert” could. Grade 4 students at CMIS with their animal models. Back row from left: Laura Cobb (USA), Eun Young Shin (Korea), Peter Abbott (USA), Tan Singhanetr (Thailand), Don Weatherhead (USA). Sometimes Fourth Grade’s study of animals got dirty. The class experienced first-hand the challenges of taking care of animals and they shared the responsibility of making sure their class pets (a rabbit, a hamster, a turtle and a guinea pig!) had food, water and clean cages. The climax of the Animal Unit came when Grade 4 had the opportunity to actually visit a number of the animals they had studied in class. Khun Nipon Vichairat of the Chiang Mai Zoo, father of Grade 4 student Nam, kindly organized a personalized tour of the zoo for the students last Thursday. The chance to see lions and tigers and bears ‘up close and personal’ was one of the highlights of the term! The Animal Unit is one of many “integrated curriculum units” at CMIS that “allow our students to learn concepts and skills in a meaningful context,” says Christina Jupo, Elementary Curriculum Coordinator. Teachers select themes that can be related to multiple subject areas - from science to social studies to creative writing and art. Students not only learn about the bone structure of dinosaurs, for example; they also write stories about them, draw pictures of them, and maybe even sing a Dinosaur song or two - a truly integrated approach to learning. The school year is in full swing at Lanna International School (LIST). Already several groups have participated in field trips around the area and the Parents Teacher Organization (PTO) has organized its first bake sale and social event. The former is always a great success at Lanna and this proved to be no exception. Everybody enjoyed the varied and delicious fare provided by the parents. On Friday, September 5, the PTO hosted their annual barbecue. The weather was unkind, to say the least, but as the pictures show, the rain did not dampen the spirits of the students, parents and staff who attended, and everybody thoroughly enjoyed themselves. 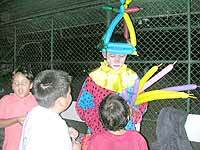 The children did not mind it at all ... as long as the entertainment was there it was fun! Filled to capacity and the food tasted as good in the rain as it would have without. Each month, more than five million baht is spent in Chiang Mai on English language classes at private schools employing occidental teachers. Yet any cursory stroll through a shopping mall or a brief encounter with a service staff at a tourist destination or a simple inquiry of a university student reveals that much of what is uttered is merely a series of sounds that generally escape easy comprehension. So a book awaits a writer inquisitive enough to answer some basic questions: why is the quality of English language education decidedly dreadful? But of greater importance: why is there as much indifference about this situation despite an ever increasing diversity of institutions catering to most income groups? A skeptic may claim that there is no problem since the system remains stable. Though Thais subsidize the almost standard-less system and teachers receive paltry percentages of the considerable profits, everyone else remains indifferent enough to remain silent. True, indifference born of ignorance admits of less reproach than does acceptance of the abysmal. But why should we settle for this? Let’s start with what is taught and why. The traditional approach to second language learning relies almost exclusively on a teacher, a textbook and tapes. Call this the teacher-centered approach. The teacher stands on Mount Olympus, proclaiming the rules of the language game, teaches grammar as if it’s as sacrosanct as the chalice during Holy Communion, drills students on what must be so and graciously allows them to participate ever so humbly when the occasion demands. Though there are moments of heightened animation, the pace is slow, progress languid and the students rarely learn how to acquire linguistic knowledge independently of their hallowed teacher. Thais are exceptionally knowledgeable about the formal structure of grammatical categories; yet they seldom learn how to combine words and phrases and clauses that make such otherwise worthless knowledge worthwhile. The pedagogical style of most schools only reinforces these tendencies though an imaginative failure to teach vocabulary and word-groupings (collocations) that allow speakers to express their ideas, feelings and attitudes in idiomatic English. A secondary effect is that world-weary westerners enjoy a self-satisfied complacency about the whole affair. The low state of Thai progress in English summons dated forms of Oriental’s chauvinism (they can only copy us, not think for themselves or do without our expertise). Superiority breeds contempt. So it’s their fault they can’t learn. 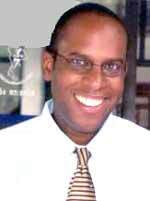 To suggest that maybe the schools, perhaps even the teachers are part of the problem remains taboo. But consider the obvious: class sizes remain much too large to do anyone any good except the owners/managers/investors. Books that were originally designed for Europeans or westernized Latin Americans and are therefore filled with Anglo-American assumptions, remain pitifully inadequate for developing Asian countries. Yet every bookstore in the kingdom is filled with them and schools make tidy profits on selling them to their students. Few schools have more than five proficiency levels (starter, elementary, pre-intermediate, intermediate and upper-intermediate) and opening mixed-level classes is the norm. Failure on the end of course exam is no barrier to promotion. There are few academic standards and even when formally present, business interests trump most other considerations. So why is the traditional approach now the standard-bearer? It’s easier for schools and teachers and familiarity keeps the students content, which in turn stabilizes enrollment. Admittedly, tradition in morals occasionally has merit; but in education as in politics, it more frequently preserves what is no longer pragmatic. In the 21st century it should be possible for Chiang Mai to do achieve more creditable results in English language education. There is a critical mass of dedicated teachers and a precious few schools with innovative curriculums. Chiang Mai has a sufficient amount of intellectual resources and creative souls to generate ideas and offer solutions. In subsequent weeks these issues will find their way into print. Payap University, the first private university in the city of Chiang Mai, celebrated its 30th anniversary at its Tharnkaew Campus, on Huay Kaew Road. In addition to the three decades, the opening of the newly renovated Crystal Spring House was celebrated. Dr Boonthong Poocharoen, the president of Payap University presided over the anniversary as well as the opening night party at the Crystal Springs House. Students from the university’s Arts and Cultural Center performed dance routines, and followed by cocktail shaking displays by students in the field of hotel management. The Tharnkaew campus’s Crystal House is situated on 10 rai of land and has 28 rooms, with 24 being standard rooms and the remaining four deluxe. There is also a dining room and a conference room that can cater for 80-100 guests. Payap University also offers a special room rate for the general public. 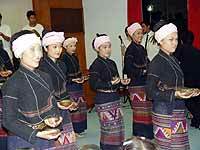 Thai dancers perform the candle lamp dance. 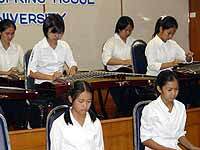 Students provided musical entertainment during the celebration of Payap University’s 30th anniversary. Lovely women perform the time-honored umbrella dance. 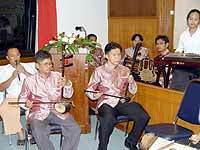 A Thai instrumental band performed at the celebration.